I just spent twelve decades in a cave with no light eating nothing but canned sardines! I was imprisoned there by my evil twin. Bathing was a challenge as there was no water and no light. As you can imagine, I couldn’t cut my nails either because of those reasons above. That was kinda a non-sequitur. Let’s talk about Kerem (our kiddos, the oldest age group and CITs of the camp!) Our gladiator chanichim (campers) were last gladiating (new word!!!) on a relaxing Wednesday evening. 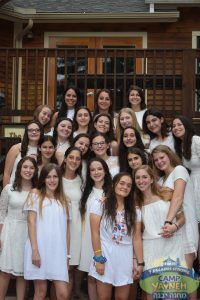 Thursday we awoke to our first normal morning schedule of mifkad (camp gathering and flag raising), tefillot (prayer), aruchat boker (breakfast), and nikayon (bunk cleaning)! After brightening our eyes and bushying (he’s in a roll with making up words!! A ROLL!) 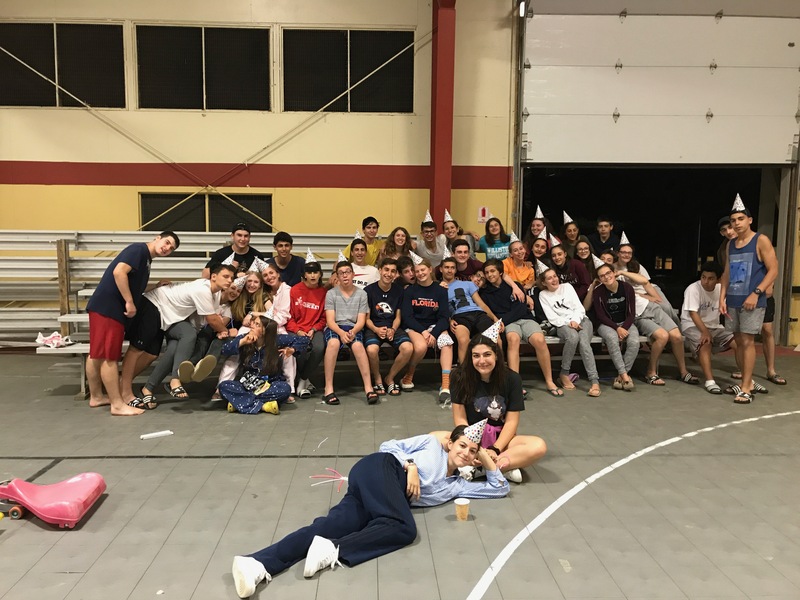 our tails, we spent the morning practicing for our hatzagah (play, which is Damn Yankees, which we perform this month for all of camp), being assistant staff for chuggim (electives), and working in committees on things like Zimriyah (our signing competition–more on it soon! ), our introduction to all of machaneh (camp), bringing spirit to Yavneh, and more! A rousing aruchat tzohorayim (lunch) of grilled cheese and tomato soup sealed the deal–the morning was gOoOoOoOoOod. Come the afternoon we worked more on our machazeh (this is just another word for play) and had some time playing sports and jumping on the Kangaruach (a massive inflatable trampoline–it’s literally a hot air balloon but it’s in the ground. We know it’s ridiculous. It’s also diggity-diggity-DOPE!). Overall, I would rate the day a 4 on a scale of 1 to 4. So the best. Great. That night we had a read through of the Damn Yankees script (it’s adapted from the original don’t worry) and then had another of our Kerem privileges: a barbecue after our night activity! We hung out by the tennis courts and played some fun sports. “A hot dog for all!” That’s what we were chanting the whole time. We chanted that as we fell asleep, wafting to sleep with BBQ sauce on our fingers and BBQ sauce on our lips. Friday hit us with the usual schedule in the morning (omelets for breaky!). In the afternoon we had some more chazarah (practice) for the machazeh and a meeting with Yavneh’s staff about sleeping in for the staff Saturday night. What does that mean? I’ll tell you! Saturday nights and Sunday afternoons when all staff meetings occur, the Kerem act as madrichim (counselor), hanging out with all of the kids in camp and putting them to bed. I will tell you how this went in the next paragraph, but here’s a teaser: the night was amazing, WOW! Shabbos. Oy tatte, der heilege Aibishter, Ribonosheloylam, du du DU!!! It was magical. Kerem led zemirot (Friday night fast-paced singing) for the entire camp and it was actually amazing. Seriously. On their first try they were better than most Kerem‘s are by their last. Stunning, A+, here’s a snow cone. Shabbat brought in the otherworldly calm, the rush of spirit and energy, the feel of freedom and unity: it was #lit. As for Saturday night Kerem sleeping in, you ask? The night was amazing, Kerem was amazing, and all of the kids/tzevet (staff) this writer has spoken to has confirmed the experience was the best Kerem coverage they can recall. WOW! Sunday morning brought a schedule switch up: 730 wake up, nikayon until 830, and then mifkad, tefillot and aruchat boker. As the kids putter around in a puttery fashion that morning. In the afternoon we had an educational peulah with the mishlachat (Israeli staff) about our relationship to Israel. Also there was basketball and flower pressing. Also also we voted on Zimriyah songs and had birthday ice cream!! That night for dinner: STEAKS! In honor of the Rose (two twin Kerem chanichot‘s [female campers] birthdays)! Dang were they juicy. Dang indeed. Stay tuned for more news. Until then–that’s the waAaAaAaAaAay the news goes!